Across a range of political activities – from attending political rallies to donating to campaigns – voters who back Democratic candidates for Congress are reporting higher levels of political activity than GOP voters. But both sets of voters share a view that the upcoming election is important: About three-quarters in both parties say it “really matters” which party wins control of Congress in this fall’s election. The new national survey by Pew Research Center, conducted July 30-August 12 among 4,581 adults, including 4,000 registered voters, finds that 14% of voters say they have attended a political rally, protest or campaign event in the past year. 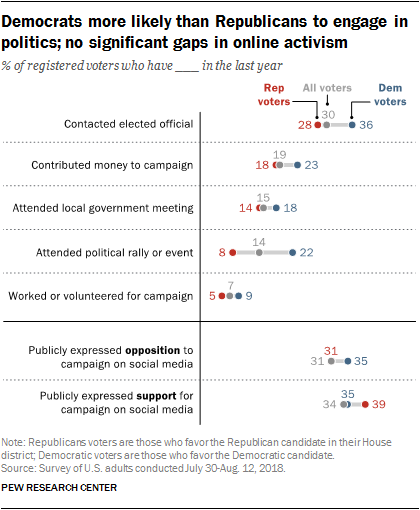 Among registered voters who favor the Democratic candidate in their House district, 22% say they have attended a political event, compared with just 8% of those who support the Republican candidate. The differences are more modest in the shares saying they have donated to political campaigns; still, 23% of Democratic voters say they have done this in the past year compared with 18% of Republican voters. Democratic voters are also more likely to have contacted an elected official (36% vs. 28%) and volunteered for a campaign (9% vs. 5%). However, Republican voters are slightly more likely than Democrats to say they have expressed support for a candidate on social media (39% vs. 35%), while Democrats are a bit more likely to have expressed opposition to a candidate on social media (35% vs. 31%). Overall half of Democratic voters (50%) report having participated in at least one of four campaign-related activities asked about on this survey (excluding social media activities). This compares with 40% of Republican voters. In both parties, especially among Democrats, there are educational differences in reported political activism. Nearly two-thirds of college graduates who support the Democratic candidate in their House district say they have engaged in at least one of the four political activities, compared with 39% of Democratic voters who have not completed college. Among Republicans, the educational differences are less pronounced (45% of college-plus Republican voters, compared with 37% of non-college Republicans). The survey finds no significant gender differences in political activism among voters in either party. About half of men (51%) and women (49%) Democratic voters say they have engaged in one of the four activities, compared with roughly four-in-ten men (40%) and women (39%) Republican voters. Given a four-point scale on the importance of partisan control of Congress, a majority of registered voters (68%) place themselves at the top of the scale, meaning it really matters to them which party gains control. This opinion has changed little since February, when 65% said which party gained control of Congress really mattered. Large majorities of voters who support a Democratic candidate (78%) or a Republican candidate (75%) say partisan control of Congress really matters; among those who do not express a preference for a major party candidate or say they are unsure, far fewer (23%) say it really matters. While the overall partisan gap is modest, it varies substantially within subgroups of voters. For example, nearly seven-in-ten Democratic voters who are younger than 35 (69%) say it really matters which party wins control of Congress, compared with less than half of younger Republican voters (44%). 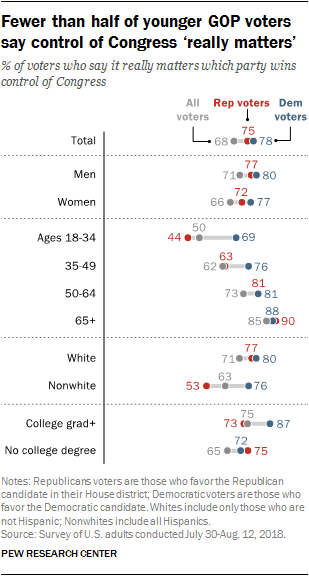 By comparison, there is no partisan gap in these views among voters 50 and older. 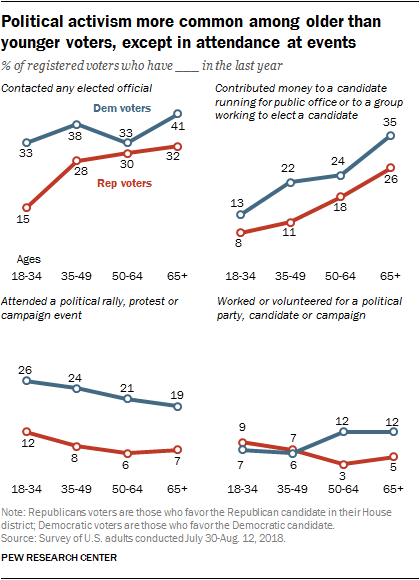 Older voters are more likely than younger voters to report participating in many forms of political engagement. The divide is starkest in political contributions: In both parties, those 65 and older are about three times as likely as those under 35 to have made a financial contribution to a candidate or groups working to elect a candidate. 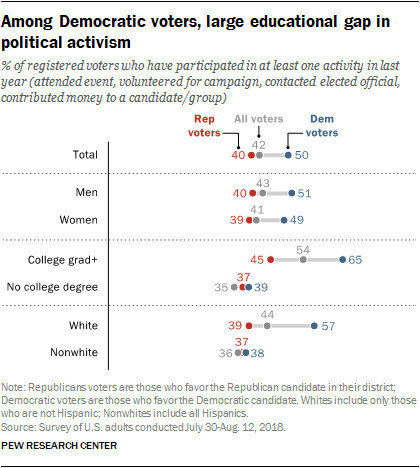 In contrast to most other forms of participation, younger voters – both Republicans and Democrats – are more likely than older voters to say they have attended a political rally, protest or campaign event in the past year. Older voters are more likely than younger voters to report participating in many forms of political engagement. The divide is starkest in political contributions: In both parties, those 65 and older are about three times as likely as those under 35 to have made a financial contribution to a candidate or a groups working to elect a candidate. Over four political engagement measures, the partisan gap between supporters of Democratic candidates and supporters of Republican candidates generally holds up across different age groups. Overall, fairly comparable shares of Republican and Democratic voters say they have used social media to publicly express support or opposition for a candidate, elected official or political campaign on Facebook, Twitter or other social media. However, there are substantial educational differences within parties – and the patterns differ among Republican and Democratic voters. 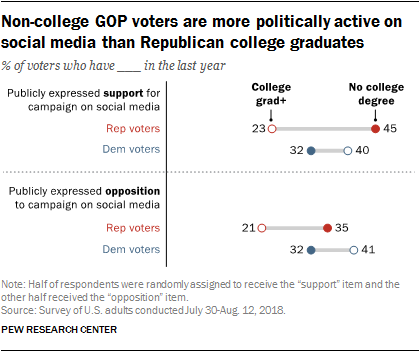 Supporters of Republican candidates with a college degree are substantially less likely than those without a college degree to say they have used social media to express support or opposition for candidates, elected officials, or political campaigns on social media. The opposite pattern holds among Democratic supporters. Democrats with a college degree are significantly more likely than those without a four-year degree to say they have expressed support or opposition to political figures on social media.